“It’s snow. Soft summer snow!”, she says. So it is. Just light flakes. It isn’t that wet slush that sometimes falls and runs unpleasantly down your back as it melts. Summer snow is not unusual here, high on Mt Wellington, it’s just that people visiting the state — people locals call ’mainlanders’ — don’t associate snow with summer the way Tasmanians do. Now, those soft flakes are becoming tiny, hard particles of ice, flurries of which will come and go as we cross below the Organ Pipes. I zip up my jacket and we walk on. 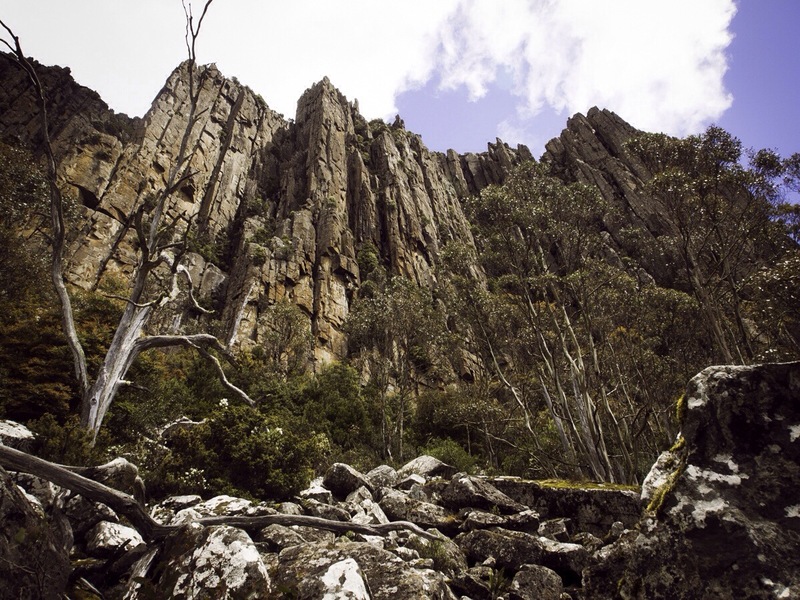 The Organ Pipes Track is a well made route that takes you from The Springs, now far below where we stand, along the base of Pipes, the the dolerite cliff line so favoured by the city’s rock climbers. Not far ahead, side trails lead to the start of climbs that are vertical and exposed to sometimes hostile, cold winds and wet weather or, alternatively, that bake in the clear sunlight of summer. Sometimes, being in a place triggers memories. As we approach the Organ Pipes I remembered that day years ago when I was a member of a rescue team that retrieved an injured a man from high on the Pipes. Today, however, we are transiting the base of the Pipes that rise more than 120 vertical metres above us. The Chalet is a waypoint on our walk along this popular track. It’s a somewhat grand name for what is nothing more than a stone picnic shelter beside the summit road. For us, though, it’s a suitable place for a break and a snack and to get out of the cold drizzle. 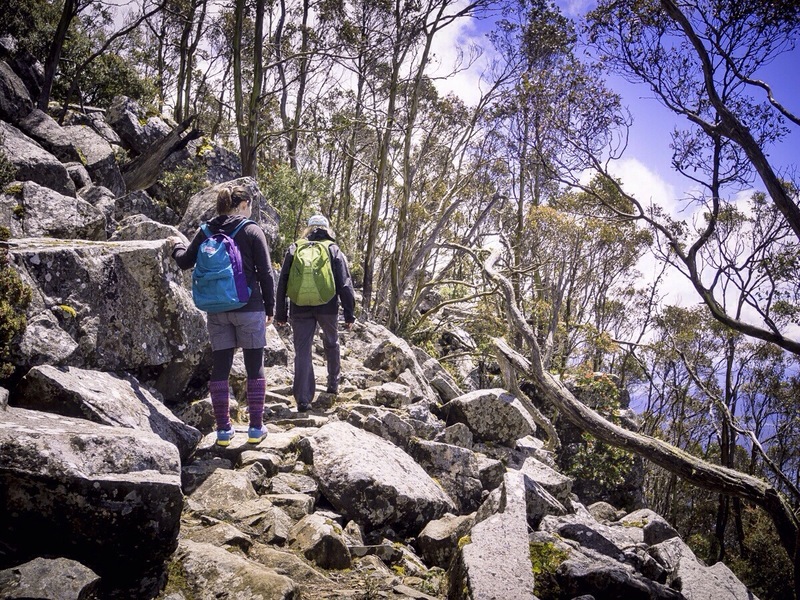 We had earlier passed the intersection with the Zig Zag Track that climbs steeply through scattered, stunted snow gums and subalpine heathland. Take the turnoff and you zigzag your way steeply up to the summit plateau. “That’s a journey for another day”, I said to Fiona and Minako who sat waiting for me at the intersection of the tracks. As usual, I was lagging behind taking photos. “Hey, here it is”, I call, pointing to the steep start of Hunters Track. I wasn’t sure where it takes off the summit road but here it is, just a couple tens of metres downslope of The Chalet. Down we go, down a sometime steep, rocky track into the taller forest below. Hunters is one of those tracks that, if you’re not familiar with it, seem to go on and on. I should note here that there’s a lot of these in Tasmania. Now the topography became a little less steep and we encounter another party scrambling about in the scrub near the track. Soon we emerge into the clearing around Junction Cabin. From here, trails lead on to Lenah Valley, up the Hunters Track down which we had descended and downwards towards Hobart’s southern suburbs. The mountain is laced with foot trails and, for Hobartians, that’s a good thing. 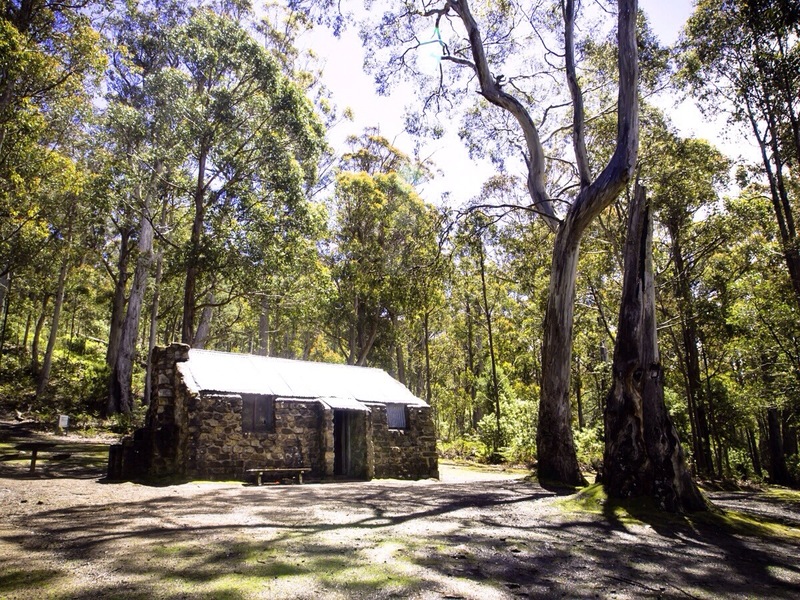 Junction Cabin is a stone building amid tall eucalypts. 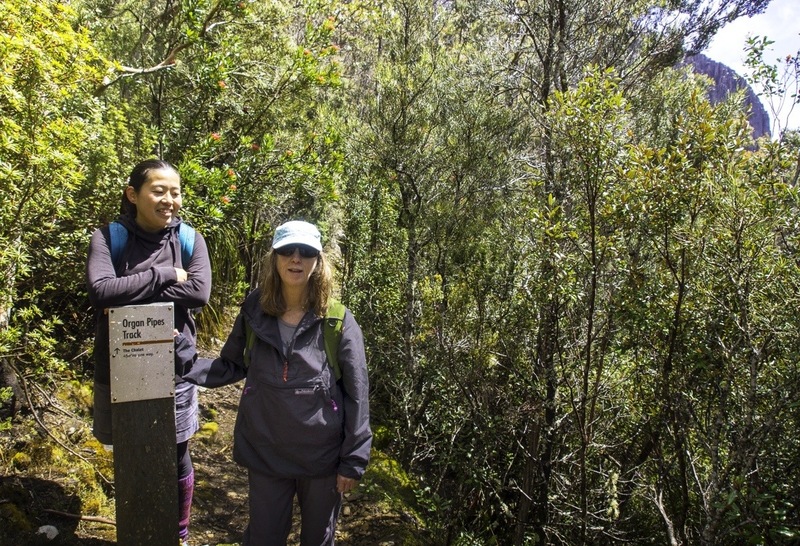 Here, we take a short break before we set off southwards along the Lenah Valley track, passing the turnoff to Sphinx Rock and on past Rock Cabin to return the good part of an hour after leaving Junction Cabin at The Springs, where we had started out. People find different pleasures in mountain walking. Fiona dislikes scrambling over the scree slopes that have slid down the mountain as the cool temperate climate shatters the dolerite above. She’s not even happy where there’s an easy trail crossing the scree. I, perversely, like rock hopping though a little over a week later I would ding my leg doing this on the mountain’s summit plateau. Minako didn’t say much of what she liked about the walk. She had doggedly put her head down and churned on along. As for myself, I liked it all. The Organ Pipes — 120 vertical metres.